Host: Milan, capital of professional hospitality. Present! 2017 sees the return of Host, the biennial exhibition dedicated to the Ho.re.Ca, foodservice, retail, Mass Retail Channel and hospitality sectors that celebrates its 40th edition this year. Host is a highly anticipated event, an international benchmark for the industry. Over 5 days, in 14 pavilions and 3 macro areas (professional catering, bread, pizza, pasta; coffee/tea, bar, ice cream, pastry; furniture, table), the exhibition welcomes some 2,010 companies, 1,255 Italian and 826 foreign representing 51 countries, to present the world of hospitality and professional catering. The most important machinery, equipment, supply and semi-finished products manufacturers, distributors and retailers and every kind of related business: from restaurants and pizzerias to bars and pastry shops; from health centres, gyms, spas, to hospitals, cinemas and museums. And every type of profession: chefs, butchers, bakers, architects, designers, installers, technicians etc. Host is a genuine business resource: it is not just a chance to meet new expert operators and to gain more contacts to further your own goals, but it is also an opportunity for opening up to new markets, especially international ones, to start negotiations and develop new businesses. Host also offers a greater appeal to visitors than any other similar exhibition since it is possible to meet a huge number of excellent exhibitors and get a sneak peek of all the new products. What are the focal points on which Host is structured this year? The keyword is still innovation that links to the concept of sustainability: the environment is once again at the forefront, the hub of ideas and solutions for concept stores and fittings, in the use and production of materials that are practical, attractive, sought-after but always eco-friendly. Made in Italy, style and the evolution of trends will also be the theme of meetings, conferences, insights and events. What makes Host a magnet for industry operators and visitors alike is actually the opportunity to get a preview of trends in catering, new technologies in food processing, and new designs and lifestyle etc. The world of catering has changed and the industry professionals have adapted themselves and accepted the challenge by taking on board new consumer styles and new more healthy or “trendy” choices and by opening the doors to technology, both in the dining area and in the kitchen. Technology and innovation covers systems, equipment, washing machines and all new solutions dedicated to mass catering, banqueting, restaurants, large catering chains and specialist retail. A wide variety of products, stimuli and ideas to see and discover at Host. That is why, we at Krupps, could not miss this important date in the diary, which in terms of technology, applied to professional washing systems, we know quite a lot about. Our IKLOUD WIFI control system and the UNIKO touch screen display are highly sought-after products in the market because they are true restaurant-oriented solutions that improve the efficiency of an establishment. With iKloud, the user can access the machine remotely and perform any modification that would otherwise need to be done directly on the display, therefore always staying connected with the dishwasher and informed on activity status, with notifications also in case of faults, and being able to optimise consumption. UniKo’s user-friendly and cutting-edge interface clearly shows cycle progress and enables you to manage various functions, such as choosing the wash cycle, simply by choosing an icon. 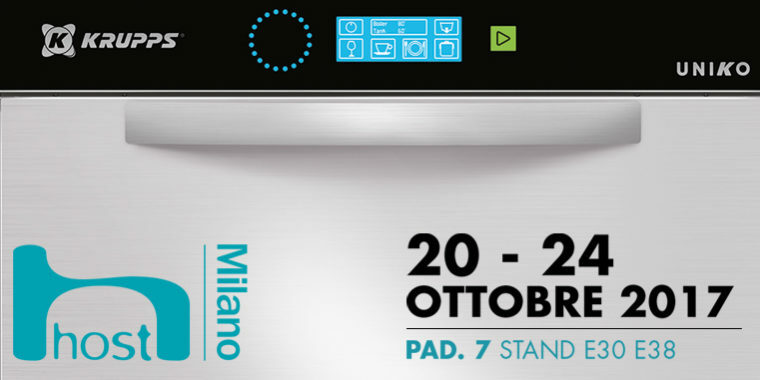 So, we look forward to seeing you in Milan from 20 to 24 October at pavilion 7 stand E30-E38 to find out more about Uniko and iKloud, don’t miss out! Innovation, our watchword, experience it firsthand!